Mezcal, whether produced in Oaxaca or in other Mexican states, struggles to get the recognition it deserves, and more importantly the foreign revenue it's capable of generating for Mexico. Hence ProMéxico has taken the bull by the horns and is attempting to elevate the image of mezcal to par with not only tequila, but also scotch, vodka, gin, brandy and all the other household spirit names. "We're trying to position mezcal on the international stage, by creating an accurate image," says Thalia Friligos Reyes, the sole representative of ProMéxico in the state of Oaxaca. "That's how we'll succeed. First we must create a positive perception. Without it, the umpteen brands of mezcal produced in Oaxaca mean little." In her view, tequila doesn't need the same level of assistance from the Mexican government. "Tequila is already up there with the other major spirit classes; mezcal isn't," she says. "Too many people still have the erroneous idea that all mezcal is strong, cheap and has the worm. But in the two years I've been at the helm of the ProMéxico Oaxaca office, I've noticed a positive change, albeit somewhat minimal, in consumer attitude and knowledge." In a recent interview, Ms. Friligos nevertheless acknowledged that her task is daunting. And to top it off, from her small office in suburban Oaxaca she's in charge of promoting international investment in and export of all goods and services in Oaxaca, not just mezcal. ProMéxico is one of the newest agencies of the government of Mexico, formed in 2007. Its stated mission is to "plan, coordinate and execute strategies to attract foreign direct investment, promote Mexican exports of goods and services and encourage the internationalization of Mexican companies in order to contribute to the economic and social development of Mexico." Ms. Friligos' office contains shelves packed with product samples and promotional materials. They serve as a reminder that she's in charge of everything produced in Oaxaca. But it's the consumables which stand out; chocolate, coffee, sal de chapulín, instant tejate mix, and of course mezcal. She stresses that coffee, mangos and mezcal are three key products for her. "But the first two don't need the same help as mezcal," she continues, "either in terms of recognition as quality Mexican foodstuffs, or in order to obtain a fair market share. Look at the number of mezcal producers in the state compared to the relatively few export producers of mangos, and even less when it comes to coffee. Coffee and mangos generate healthy revenue from few producers. Then consider mezcal in Oaxaca; there are so many producers in such a large, untapped global marketplace." In July, 2011, for the third year running, Ms. Friligos, with the support of ProMéxico's head office and assistance from her counterpart in Puebla, brought international spirits vendors and promoters to Oaxaca for a three day promotional mezcal event. It was no coincidence that the mission took place during Oaxaca's annual Feria Nacional del Mezcal, a multi-faceted event with a singular main draw for tourists and residents alike: an opportunity to sample a broad variety of mezcals from the dozens of small booths set up by participating mezcal producers. "ProMéxico operates its event independent of the mezcal fair," Ms. Friligos clarifies. "The Feria Nacional del Mezcal is essentially a state supported and organized event, held in cooperation with COMERCAM (Consejo Mexicano Regulador de la Calidad del Mezcal A.C. - the regulatory body which oversees commercial production of mezcal for predominantly international export). "But inviting a group to come down while the fair is on makes it that much more diverse an experience for our guests," Ms. Friligos continues. "The Feria del Mezcal helps to give them a more complete picture of what Oaxaca is all about; craft and food booths, overall ambiance, of course getting a sense of the widespread interest in mezcal, and that feeling of exhilaration that is a byproduct of attending any festive event in Oaxaca. Mezcal is almost synonymous with Oaxaca, so it's important for our clients to experience as much as possible of what Oaxaca has to offer." Guests arrived throughout the day on July 27th, and were taxied to Hotel Misión de Los Ángeles, one of the larger Oaxacan hotels, selected both because of its conference facilities and convenient location within walking distance of the grounds of the Feria Nacional del Mezcal. The first evening dinner, as one might have guessed, included mezcal tastings at a nearby restaurant. It also played host to a Guelaguetza, the famed folkloric festival showcasing the dress, dance and music of Oaxaca's 16 indigenous cultures. The next two days were spent in plenary sessions, meeting 20 different mezcal producers to learn about their spirit lines, production methods and of course export capabilities. Later on during the afternoon of the 28th guests attended the mezcal fair, and the following day a lunch at acclaimed Oaxacan restaurant Los Danzantes. Federal government representatives and state dignitaries were in attendance, including Oaxaca's secretary of tourism and economic development. As with many successful events, and this conference was no different, there's often not enough time to fit in every agenda item. The group was unable to visit one of the out-of-town mezcal factories (fábricas de mezcal). However, a couple of guests did manage to snag a factory rep and have him drive them out to his fábrica in the Tlacolula mezcal producing region. "We couldn't have asked for a more successful event," Ms. Friligos beams. "Everyone was thoroughly impressed with Oaxaca, but more importantly from the perspective of ProMéxico and its goals, our guests left with a new understanding about mezcal. To the extent that anyone in the group had lingering misperceptions about mezcal, they were dispelled through our ability to fully educate. "Through the seminars, discussions and samplings, our guests left appreciating that mezcal can be used as a mixer just as easily as for sipping, given the diversity of product," she continues. Then returning to the concern that mezcal may be slow to catch up to tequila, Ms. Friligos points to the significant advantage that mezcal has over its sister spirit. 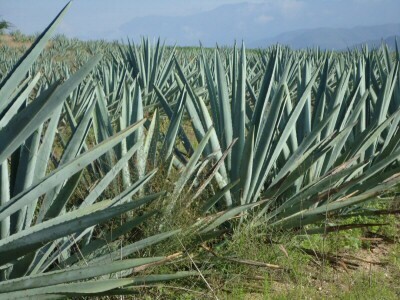 "Although there are tremendous variations in tequilas based on producer, recipe, and aging, tequila production is restricted to using one variety of agave. Mezcals, on the other hand, are made from 15 - 20 different types of agave, as well as blends, resulting in a much broader variation in flavor and other subtle nuances simply not achievable with tequila." Alvin Starkman is a paid contributing writer for Mexico Today, a program for Marca País - Imagen de México. An aficionado of agave-based beverages, Alvin takes couples and families into the hills to sample mezcal made by only traditional producers, and into the fields to participate in the harvesting of aguamiel, for fermenting pulque. Alvin has written over 200 articles about life and cultural traditions in Oaxaca, consults to documentary film companies, and with his wife operates Casa Machaya Oaxaca Bed & Breakfast.